When I researched and wrote my Architectural History of Randolph County in 1978, the “historic” criteria I used purposefully excluded most of the 20th century. I included a few “modern” houses, of 1950s Wrightian or 1970s passive solar designs, but most of the illustrated properties were at least 50 years of age, and the majority of those were more than 100 years old. It seemed to me then that “modern” architecture, usually connected to the architectural office Randolph County native Hyatt Hammond, had a precarious foothold in a residential environment which was overwhelmingly the product of the 20th century Southerner’s infatuation with the “Williamsburg Style”. The Williamsburg restoration began in the 1930s and almost immediately had an impact on local residences. In the late 1920s the upscale homes of Frank and Charles McCrary on Worth Street in Asheboro were designed with textbook exactitude in the English Tudor and Classical Revival styles. “Revivalist” architects such as W.C. Holleyman and Harry Barton had been trained in the old Ecole des Beaux Arts school, and were proud of their academic command of the rules and vocabulary of each style. 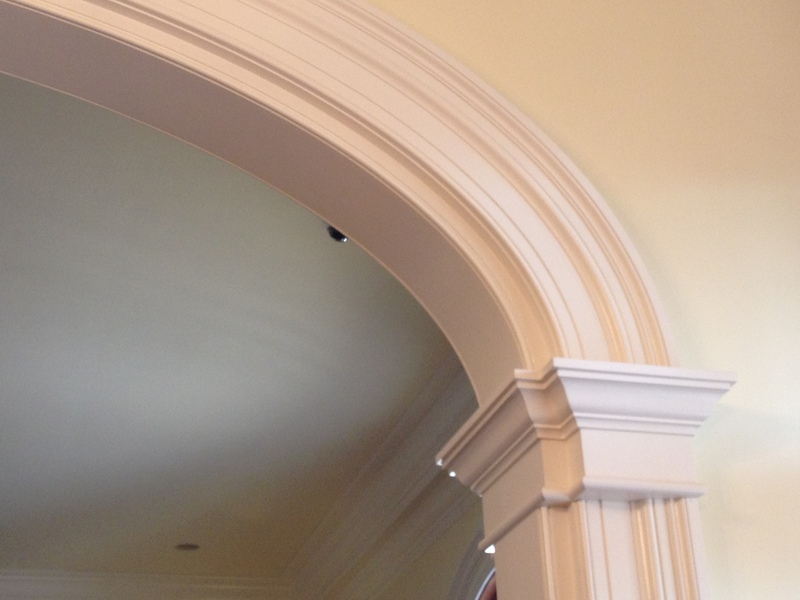 Combining stylistic details just would not have been considered proper. By the late 1930s floor plan was considered more important than the façade; functionality was the new goal of architecture instead of mere appearance. In 1939 the Sulon Stedman House on Old Lexington Road won awards by mixing and matching the red-brick details of early Williamburg with the monumental portico of Mt. Vernon and the modern open floor plan popularized by Frank Lloyd Wright. In the 1960s and 70s, almost every new “spec house” in Asheboro was grafting some kind of “neo-Colonial” detail to the “ranch house” plan that became the first choice of subdivision developers. Few owners or builders went to the expense or trouble of actually duplicating the kind of archeological correctness that was the hallmark of the actual Williamsburg restoration—the major exception in Asheboro being the Tucker Yates/ William W. Ivey house on Old Lexington Road, which is a near-copy of the Carter’s Grove plantation house near Williamsburg. A point I made in my book is that all this new construction harking back to the 18th century environment of Williamsburg, Virginia, was completely unknown to the actual built environment of 18th century Randolph County. Randolph County was still the frontier for most of the 19th century, and while the expert local cabinetmakers made furniture which doesn’t look out-of-place in Williamsburg, they usually made it for use in one-story log or frame cabins. The few high-style houses which survived aspired to the Federal style of coastal New York and New England rather than the Christopher Wren Baroque of Williamsburg. Brick homes were not seen in Randolph until the 1830s, the Dempsey Brown House of Trinity (1836) or the Elisha Coffin House in Franklinville (c. 1835) being the first known examples. A residence with 1200 square feet of heated area would have been considered a large house in the county from the 18th century through the 1950s. When my architectural survey was published in 1985 I didn’t realize it would come to document the end of local traditions such as textile and apparel manufacturing and rural farm buildings. At the very time I was researching the survey, American society was experiencing changes in communications, computerization and global connectivity that makes the Randolph County of 1980 seem quaint in comparison to the Randolph of 2011. Nothing in the social and built environment of the county better exemplifies those changes than the county’s newest old house, Linbrook Hall in Tabernacle Township. Students of historic architecture, the Neals knew what they liked, and came armed to design their dream house with photographs and magazine articles of features and details that appealed to their particular tastes and sensibilities. 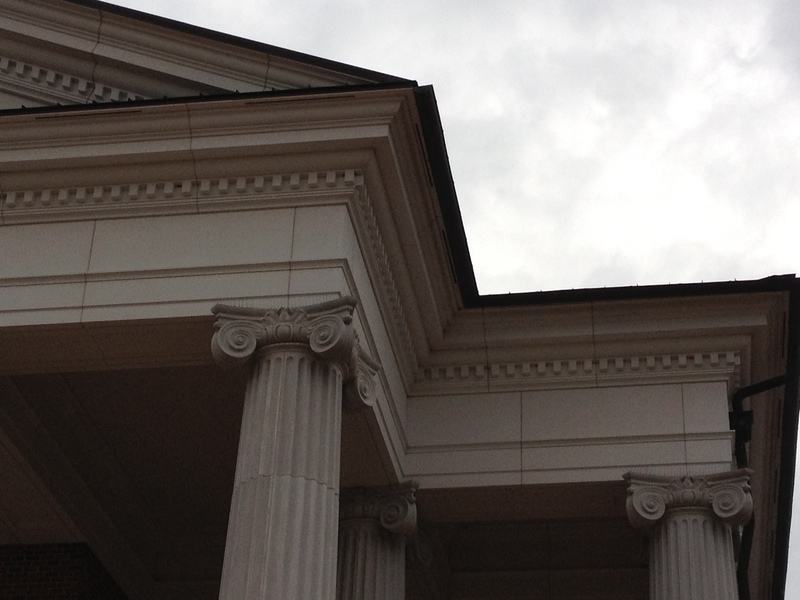 Fortunately, luck and the yellow pages directed them to Charleston architect Bill Huey [http://www.hueyarchitect.com/index2.html ] who took their many details and desires and combined them all in a strong traditional design, grounded in Jeffersonian Classicism and high-style Greek Revivalism. Sited high on top of a hill in an east-west orientation and approached by a mile-long driveway, the house is impressive in its command of its site. Its size quickly becomes apparent- eight columns 32-feet high anchor a pediment and cupola on the main block which rise almost 60 feet high. The portions of the exterior echo the principles of symmetry espoused by Andrea Palladio, Italian author of the 1570 “Four Books of Architecture” which first codified the principles of classical Roman design. 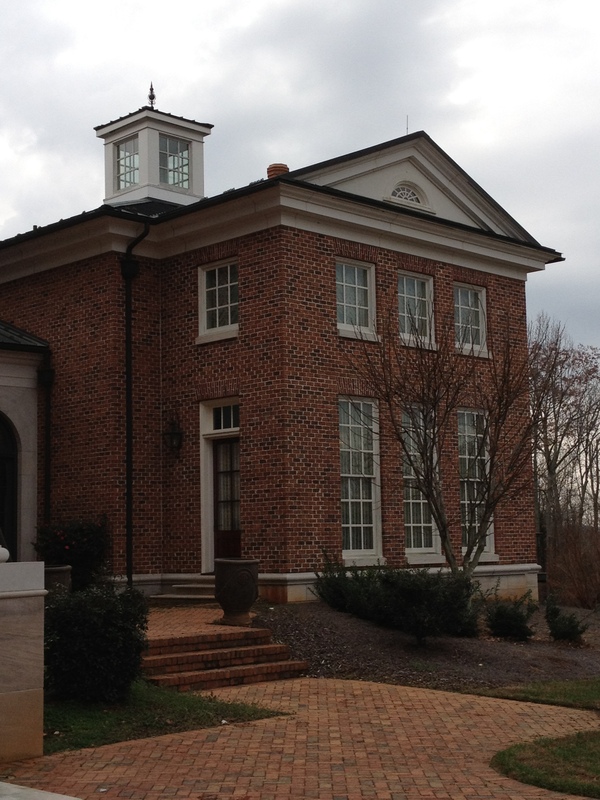 Linbrook at first look can be identified as a Palladian “villa,” or country house. 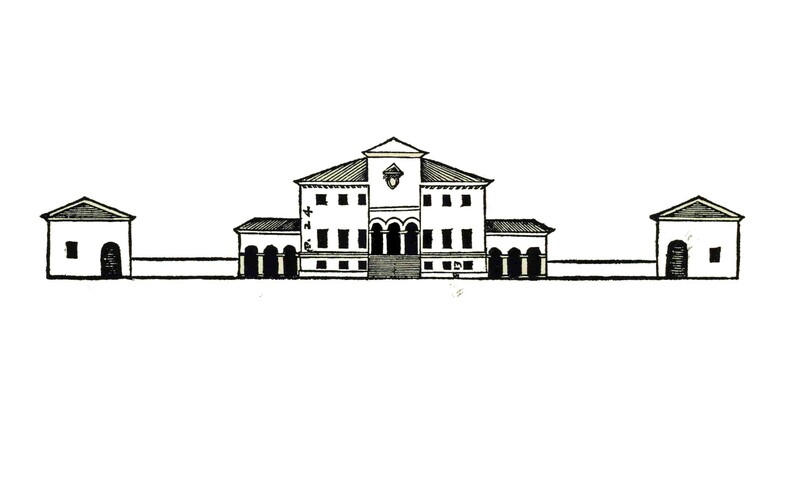 One of Palladio’s innovations was the adaptation of the temple portico to the villa, and at Linbrook the monumental portico is the signature statement of the entire composition. 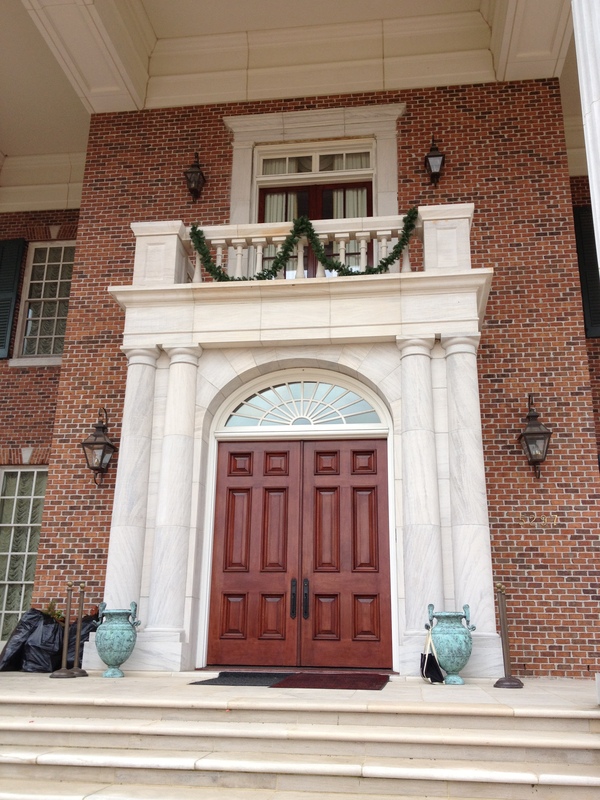 In architectural shoptalk, Linbrook Hall displays a “monumental tetrastyle prostyle Palladian portico.” Translated into regular English, that means the house has four free-standing columns across the front which project forward from the façade and create a two-story porch. The most familiar four-columned portico in the United States is that of the North Portico of the White House, which is itself a product of late 18th-century America’s fascination with classical architecture, as transmitted through British architectural sources such as Vitruvius Brittannicus (1725). That was one of the architectural works in the library of Thomas Jefferson, a particular aficionado of Palladian design principles. 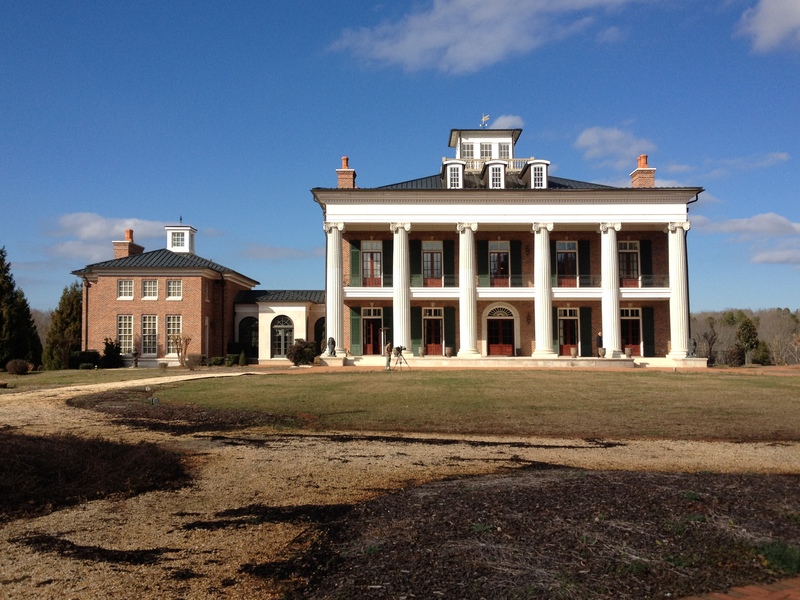 Jefferson used them in his own constructions and promoted them all across the South, where they took fertile root and blossomed into the kind of Greek Revival mansions that have come to exemplify the antebellum period. At Lynbrook, the most visible Jeffersonian design element is the floor-to-ceiling windows of the ground floor, which can be raised to provide ventilation (in the days before air conditioning) as well as easy access to the veranda or gallery. 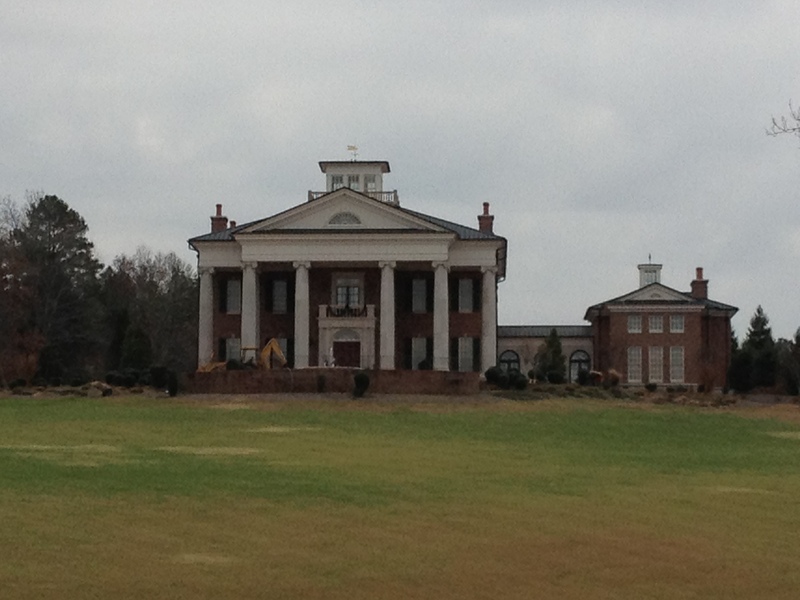 Everything else on the exterior is right out of the Southern plantation design vocabulary. 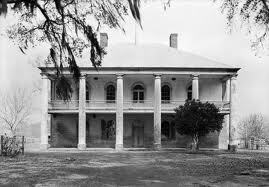 The Neals particularly admired the antebellum plantation houses of the Mississippi delta, and elements of Chretien Point Plantation (1831), Oak Alley (1839) and Nottoway (1859) in Louisiana are visible, especially in the monumental portico columns of the rear or southern façade. 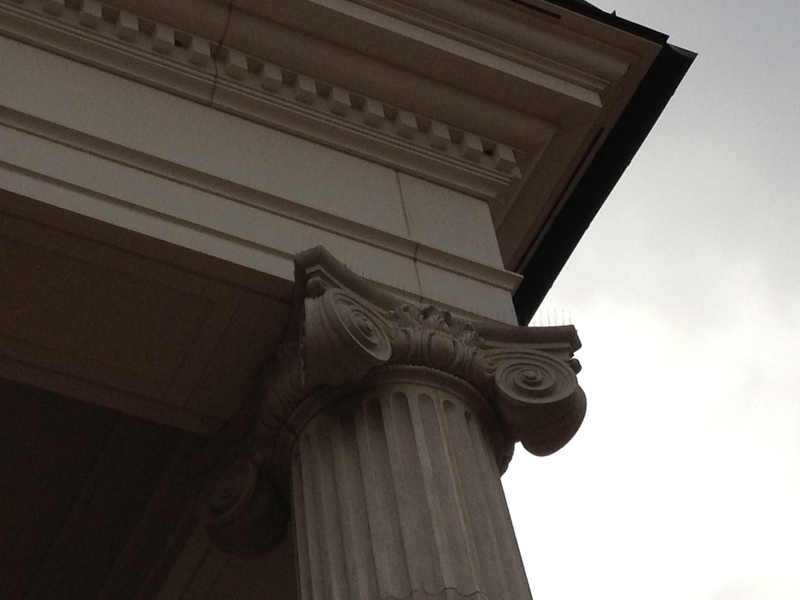 In keeping with the Palladian organizing force, the columns are of the Colossal Roman fluted type (i.e., they extend two full stories in height, and the fluted shafts have a smooth edge instead of the Greek knife-edge). 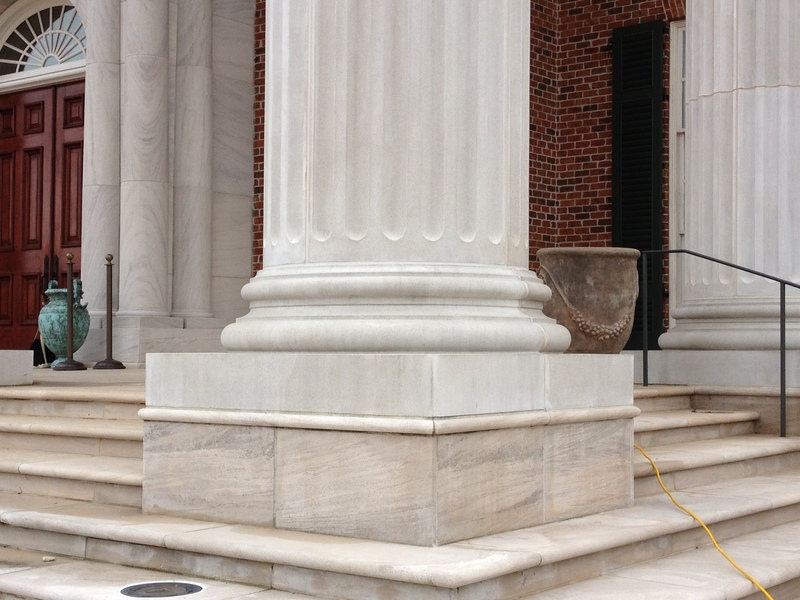 The columns are four feet in diameter on a five-foot-square base, and have the proper classical “entasis” or taper (they are 8 inches smaller at the top than at the bottom). The Colossal Order was not a true classical Roman order, but an invention of the Italian Renaissance, sometimes called the “Baroque” style, which makes it all the more appropriate that the capitals used are not of the standard classical orders. The Scamozzi capital was invented by one of Palladio’s apprentices, Vincenzo Scamozzi, who took the classic Ionic capital (two volutes, or scrolls, with an egg-and-dart molding) and angled the volutes at a 45-degree angle so that the capital appeared symmetrical instead of bilateral (that is, an Ionic capital looks the same from the front and back, but a Scamozzi capital looks the same from all four sides). Under the north portico, the entrance doors (solid oak, with each leaf weighing 400 pounds) are topped by a fanlight and framed by limestone engaged columns in the Tuscan order which support a balcony accessible from the second floor. Another fanlight lights the gable of the portico, and square cupolas (properly called “lanterns”) provide light to the center halls of both the main block and guest house. The entrance hall is the most impressive interior space, and again it has a Jeffersonian aspect, being reminiscent of the rotunda at his University of Virginia, with the proportions of the center hall of his Poplar Forest summer house in Lynchburg. A very un-Jeffersonian element, however, is the sweeping double-flight or “Imperial” staircase- an exuberantly extravagant and romantic design which Jefferson would have considered a waste of space! The first floor of the main block is organized in a modern version of the Greek Revival “double-pile” plan. A Sitting Room (to the west) and Dining Room (to the east) flank the center hall. In the rear, a more informal living area opens into a kitchen and passage into the rear garden. The formal Sitting and Dining Rooms open into the hall through tripartite frames which would be called Palladian if the central space were arched, but here the flat arches flanked by Tuscan columns and pilasters hark back even further to Palladio’s architectural predecessors Serlio and Bramante. 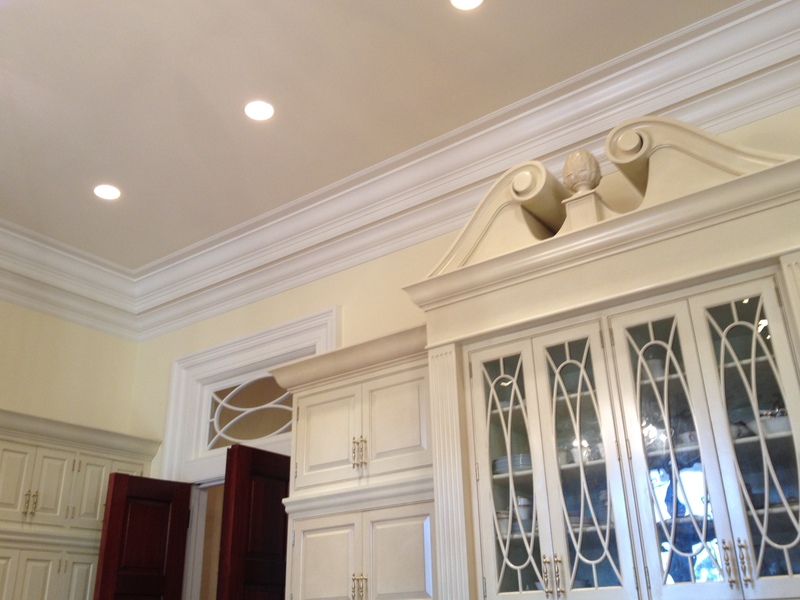 All of the interior trimwork comes from the familiar Charleston Greek Revival design vocabulary which was established in the 1830s by use of northern pattern books by the local craftsmen. Particularly influential were the works of Minard Lafever of New York and Asher Benjamin of Boston. Lafever, author of The Modern Builder’s Guide (1833), was known for his high-style townhouse designs and archeologically correct classical detailing. Benjamin, whose 1830 book The Architect, or, Practical House Carpenter, first popularized the Greek Revival style for mass American tastes and profoundly influenced vernacular home builders. Several Randolph County homes built in the 1830s used elements from Benjamin’s 1830 pattern book in designing interior woodwork, making this a very appropriate source for Linbrook to reference. I would argue that Linbrook Hall is not an example of a McMansion; not just because no established homes or neighborhoods were harmed in its construction. 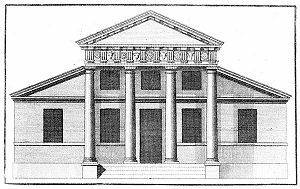 A discussion of the introduction of classicism to English domestic architecture, The National Trust Book of the English House, (Penguin Books, 1985, p.78)states that “It is often said that Classical architecture is a game, and the benefit of the rules is to make the players concentrate on excellence. Originality does not greatly matter, it is the creative use of precedent which is the standard of judgement.” Linbrook Hall is one of the few residences built in Randolph County within the past 75 years to aspire to play the game of Classical Architecture. All its elements fit and work together, and the house commands its setting as if it grew there, belongs there. The combination of house and landscape gives us the same sense of satisfaction and exhilaration we experience when viewing some natural wonder. That Linbrook triggers our sense of beauty, of proportion, harmony and balance, is demonstration enough that it is playing by the rules. 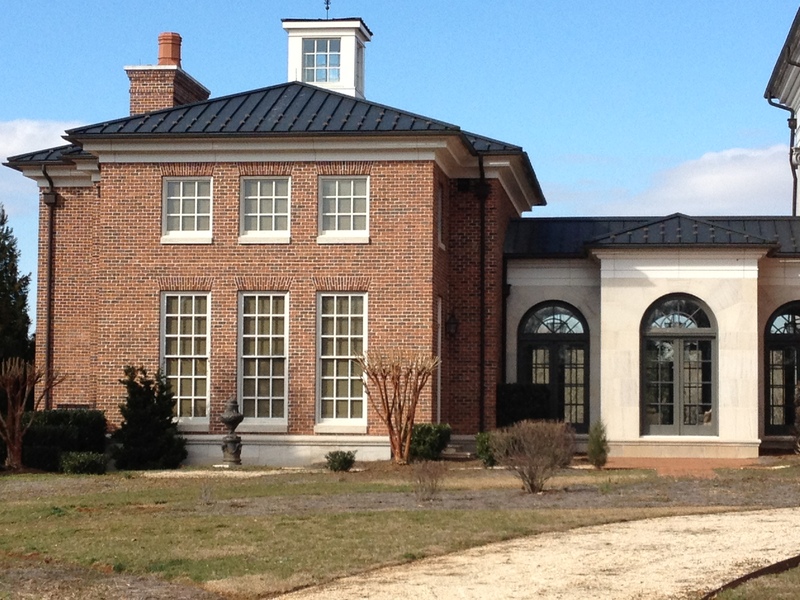 Whether in the design, or in the quality of execution and materials, the Neals and Bill Huey have created excellence and have given a gift to the built environment of Randolph County. You are currently browsing the Notes on the History of Randolph County, NC blog archives for February, 2012.